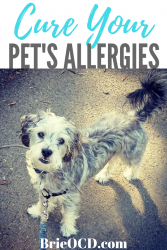 All PostsLife HacksProduct ReviewHome / All Posts / Pet Allergies: One Simple Test to Cure your Pet! No More Scratching or Licking! Louie was sick from the minute he stepped foot into our apartment. The rescue organization dropped him off and he immediately shat (diarrhea) on the carpet. Welcome lil louie! Come to find out he had giardia. Well that was just the beginning of Lemon Louie’s ailments. Shortly after the giardia issue cleared up he had this rash on his belly (pyoderma). He was constantly licking his paws (and they were RED). He was scratching his entire body so much that his hair was starting to fall out. Around his eyes was actually raw and bloody from scratching. I took him to the vet and they didn’t really know what was wrong but thought it might be allergies. The Vet gave me a medicated shampoo and soothing foot wipes that were actually very helpful with the belly rash and red paws but didn’t get to the root of the problem. What was he allergic to that was causing these reactions? Because we didn’t know what he was allergic to we tried the elimination diet. This means you eliminate all other foods/treats and solely feed him one type of food. Well, we ended up changing of foods MULTIPLE times. We were supposed to feed him the same food for two months to see if he would get better or have a reaction. Problem was that Louie would be excited for the new food and eat it for a couple days and then you literally had to hand feed him. Because he wasn’t eating, he was throwing up bile multiple times a day because the acid was building up in his stomach. Back to the vet we go! 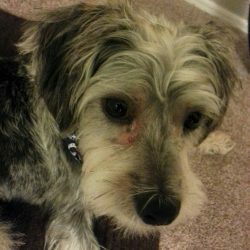 PEPCID & ALLERGY TESTING FOR DOGS? She told us to give him 5mg of pepcid at night. At first it seemed like it was helping and then ultimately I think it did more harm than good. I actually think after a few weeks of taking it, it started to make him puke because it was destroying his little tummy. Back to the vet we go! We then decided it was time to figure out what the heck he was allergic to by throwing down hundreds of dollars ($557 to be exact) to have an allergy test done. Just like they do to humans when they prick you with different stimuli to see what flares up and what doesn’t. That’s how also how they figure out what dog’s are sensitive to. My poor little guy handled it like a trooper. He ended up being sensitive to Fennel Grass, Privet and Mesquite Trees. Sooooo…. basically we still had nothing after those results. To this day, I have no idea what fennel grass, privet and mesquite trees are LOL. RAWHIDE IS MADE OF BEEF? DOH!! Then an angel smiled down from heaven and gave us the test that we needed. Hancy was talking to one of his buddies and happened to mention our Lemon Louie. 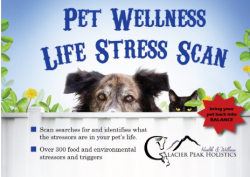 His friend told us about Glacier Peak Holistics Pet Wellness Life Stress Scan. IT WAS A LIFESAVER. This test was 108 bucks (see instructions below for 20% off), and once you receive the packet all you have to do is get your pet’s hair sample and swab the inside of your pet’s mouth and send it in. It tests for 200+ Food Items, 100+ Environmental triggers, and Beneficial Herbal and Holistic Remedies. CLICK HERE TO VIEW LOUIE’S ACTUAL RESULTS. 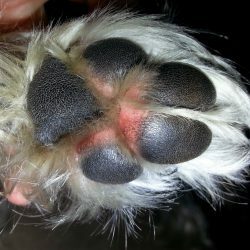 If your dog is allergic/sensitive to an item if it is in red (most of Louie’s were in red lol). If it is white that means it’s safe to eat and green is actually good for your dog. After receiving our results, we realized that Louie has very expensive/rare tastes. He can basically only eat buffalo, elk, goat, kangaroo, llama, yak, rabbit and venison. All types of meat that aren’t readily available in stores and since I live near the beach, I can’t go out and hunt in my backyard. So now what? We did some research on food and basically found that all store bought food and treats have one of the items listed in red on his report. So we were basically up crap’s creek. We talk to the vet and she recommends a hydrolyzed protein. A what? (Click here to read about hydrolyzed protein) Come to find out, it’s basically like air. Great, my dog is a vegan! 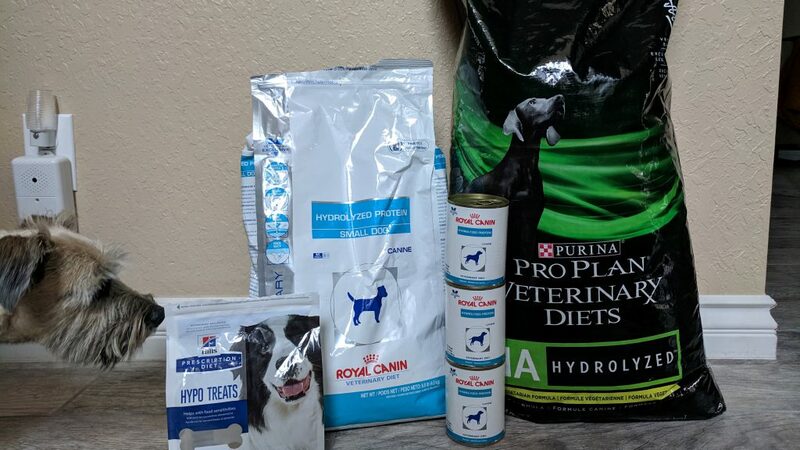 We end up with Purina HA and then somewhere along the way we also end up with Royal Canin HP in both the dry and canned form. DING DING DING DING. We have a winner!! Louie actually eats this stuff!! INSERT HAPPY DANCE HERE! Ok so we have the food down but what about treats?! A dog has got to have some treats!! Since salmon was on Louie’s approved list, we found some treats that were solely made out of salmon. However for some reason one brand got discontinued and the other brand went from $7 a bag to $32 so I obviously don’t buy them anymore. 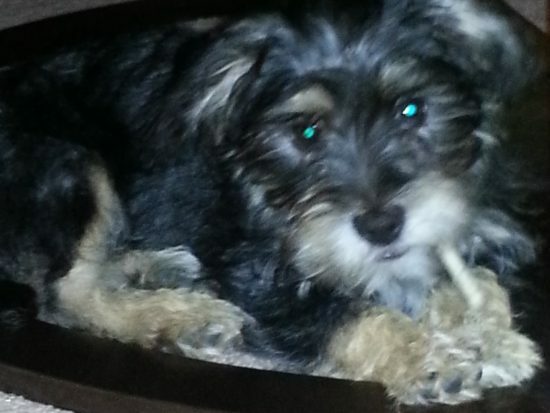 Louie’s new favorite treats are another Hydrolyzed brand from Hill’s called Hypo Treats. Louie is obsessed. Jack trying to peep on Louie’s treats! 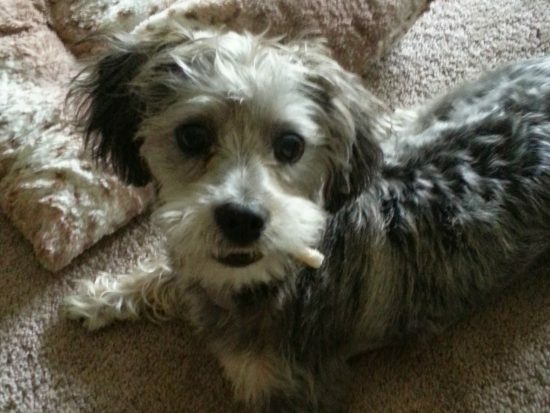 After a few months on this new food, Louie looked healthier and happier. He wasn’t scratching himself incessantly, no puking and his rash was gone. To this day he will occasionally lick his paws and when he does I just rub the Duoxo wipes (that I mentioned above) on them and he stops (its like a cooling effect). 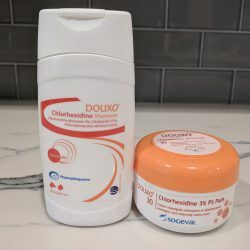 I still use the Duoxo shampoo as well, just to be safe. I am so thankful to Glacier Peak for figuring out what I needed to do to fix my little boy. If only I had known about this glorious test when I first got Louie I wouldn’t have had to spend thousands on figuring it out. If you are experiencing any of these symptoms with your dog or cat I am telling you to call Glacier Peak Holistics. I have recommended this test to several other people and their pets are better than ever. Find answers at an affordable price! See below for full list of products Louie eats and uses that I buy online at Chewy!